About two weeks ago when I was removing a lightbulb from one of my painting lamps, there was sort of a grinding sound and the threads stuck, causing the bulb to break off in my hand. I was able to remove the bottom half with a pair of pliers, and it worked fine when I put a new bulb in. Friday that bulb went dead. I was a bit curious, given the short life span, but went ahead and put a new one in. Upon turning it back on the bulb flickered for a bit before it came on to full brightness. I suspected maybe the fittings were getting loose on the lamp, and then later that night it flickered again and crackled. Today I noticed that the lamp is giving off a 'Next time I make a crackle-pop sound it will be accompanied by bursting into flames' sort of smell, so I promptly escorted it to door, and into a rubbish bin. None of this is noteworthy really, except that as I was bringing it to the trash I realized I'd had that lamp since junior high, if not elementary school. Who holds onto a lamp that long? I guess I do. I will be impressed if the $14.99 replacement I got at Target today lasts half that long. I'll try to not write any more posts about my lamps any time soon. Another adventurer. Or perhaps an antagonist? The minotaur got some fur sculpted on so he looks a lot better now. He and a few more adventurers will probably get primed tonight, but that may be the end of this little burst in production as this coming week will be mostly filled with family/holiday activities. 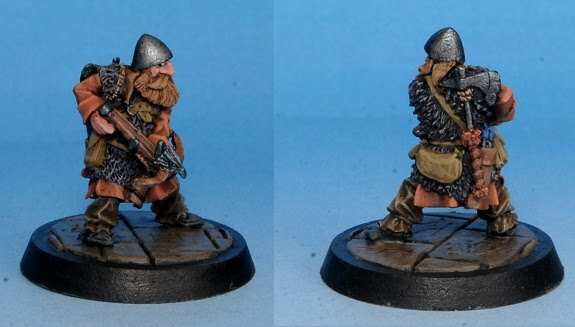 I found the 2 figures I needed to complete my dwarf militia unit to do service with the empire. They'll probably be here by the time the holiday is done as well, so that group can get underway before too long. Another delicate RedBox sculpt with tiny eyes. TINY. I was prepared to not even bother, but I think I managed okay given that I'm not doing these to my highest standard. After doing two of these, and looking closer at the others I have in the queue, I don't think I'd ever take one of Tre's sculpts on commission. Tooooo tiny. 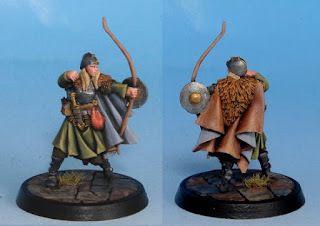 I do like the figure though, she's a pretty great nordic ranger type it nice gear. Either quite successful at adventuring, or with a trust fund to burn ? I got a great old minotaur in the mail today, sans axe. Since it was incomplete that helped me not have to pay crazy ebay prices for it, since it is from the out of print Citadel AD&D range - which usually means $$. 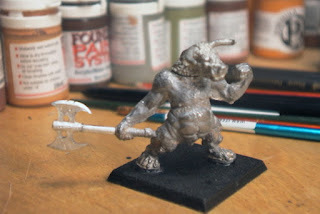 I've sorted the axe no problem, now I just need to get some putty into that terrible gap between the head and shoulders. 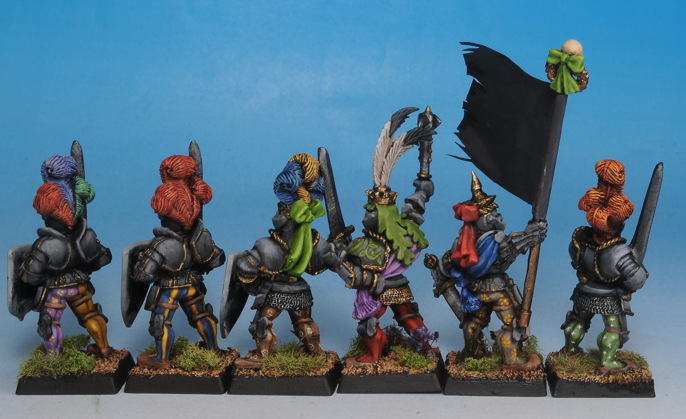 I also got all my dwarves put together- Quite a productive night!
. . . a finished unit. I finally finished the last 9 Reiksguard. Which means I've finally finished the entire reiksguard unit. Surely, such things are portents of the end being nigh.
. . . sorry, I don't know Slayer enough to make a good reference. 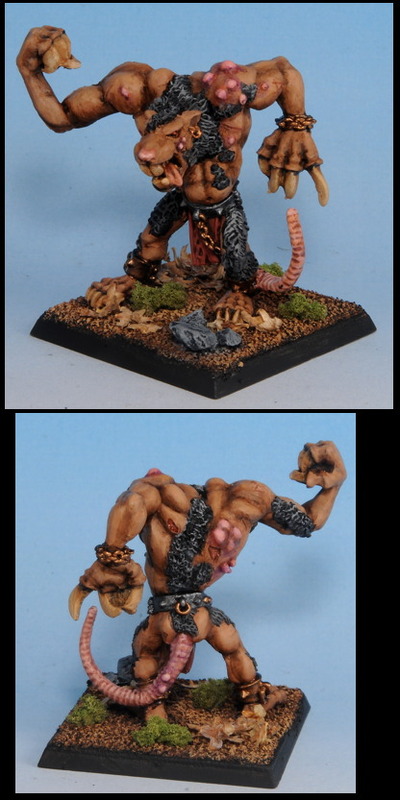 Anyway, here is the next adventurer, a dwarf slayer from Hasslefree. I've used this flesh tone before (the last dwarf, and the paladin's faces were both the same recipe), but this is the first time I've ever tried it on a big area, and I really wasn't sure it'd work. I had a hard time getting the hang of it, and that made me realize how much my own knowledge about painting flesh is really 'my own knowledge about painting flesh with /my/ recipe'. 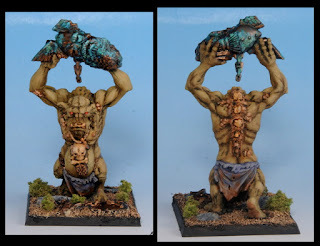 This became apparent when I did the flesh recipe guide a few months ago, but then the figures weren't /for/ anything specific ( I wasn't even keeping them) so it didn't feel like there was as much invested I guess. Anyway, it was a challenge. It wasn't until I started blocking in the rest of the figure with other colors that I began to be convinced that I wouldn't be totally unhappy with it. As it is, I'm pretty darn happy with it as a quick job, and I may keep this recipe when I get to my empire dwarf unit (though that may be a bit of a cop-out since they'll be almost all armoured, so I'll only have to manage faces). Incidentally, the recipe is Recipe #1 on the above guide. Maybe I should have looked at that picture to remind myself how to handle it. I don't normally go as dramatically shaded as this... I think thats part of what had me unsure of it. 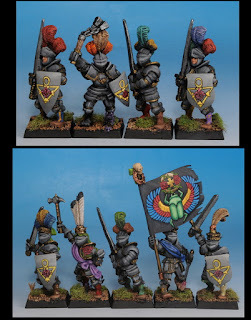 Also, I finished the last stretch of feehand on the Reiksguard tonight... the banner. w00t! All that is left is to attach it, and flock the bases. I'm stupid happy about that. 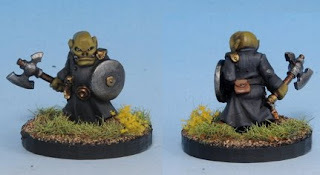 A couple little goblins of dubious trustworthyness. Are they there to lead the adventurers astray? Perhaps attack them? Who knows. 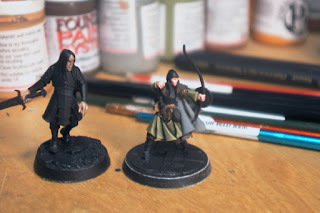 All I know is my friend John gave me these two little dudes, so I might as well paint them up for adventures! And this one I was pretty sure is either Copplestone or Spyglass.... but now I can't remember and I can't find it on either of their sites. :/ Anyone know for sure? 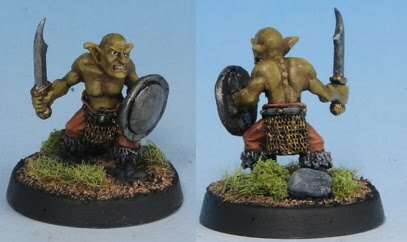 While finishing the reiksguard shields the last two days I've been working on some more figures for my quicky RPG collection. #2 is a neat little dwarven shooter. A dwarven slayer will make #4, and he's about 1/2 done. 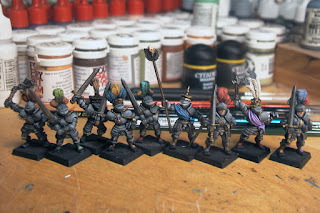 4/5 of the shields are done on the reiksguard, and their bases are underway as well, woohooo! 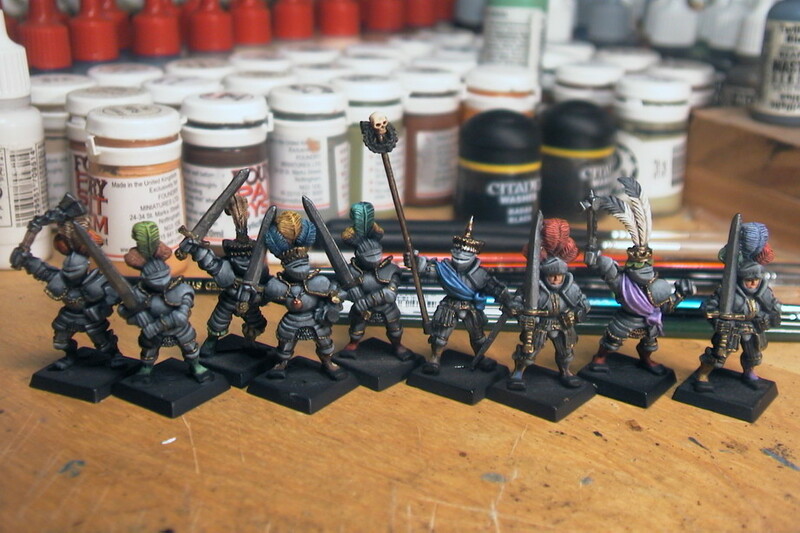 I finished all the plumage and weapons on these guys tonight. That leaves shoes, armor straps behind the knees, and some sashes on the back of the helmets, as far as general kit. Then a few bells and whistles, and they'll be ready for action. Oh, and a shield or two. Paula here is the first of a series of single figures I'm planning on doing now and then for a table top dungeon crawl type thing I'm going to eventually run at the request of some of my non-gaming friends. The idea is to use a lightweight set of rules and GM it for some friends who want to see what this miniatures stuff I do is all about. I have plenty of bad guys for them to fight, but I thought some PC figures might be nice to have for them to choose from. I've finished the big bruisers- 50mm based ogre-sized things. 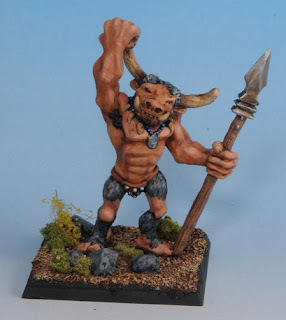 One each for Ben and Brent's armies, and then an old minotaur I found on ebay a few months ago for myself. All 3 were done pretty quickly for gaming. 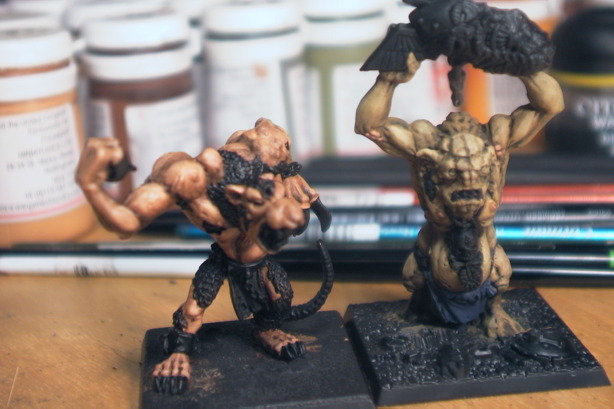 Just a quick WIP shot of some WHFB thugs I'm doing for some friends' armies. For some reason my camera was having trouble focusing tonight, but hopefully it won't be too long before there are better pics to see. 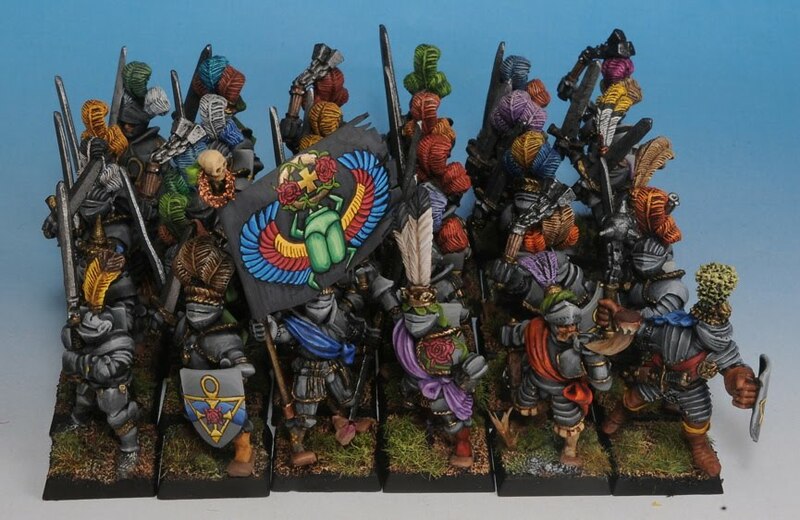 I'm also painting the feathers on the reiksguard when I have appropriate colors out, so they are moving along a pace with these big baddies.